A totally out-of-sorts PV Sindhu played one of the most forgettable matches of her decade-long international career, when she went down without a whimper to second-seeded Japanese shuttler Nozomi Okuhara by a totally one-sided 21-7, 21-9 margin in a drab 37-minute women’s singles semi-final of the Singapore Open World Tour Super 500 badminton championships on Saturday. Considering the fact that, going into the clash, the lanky Indian actually led her diminutive arch-rival 7-6 in head-to-head meetings, and had actually beaten the Japanese ace in three of their last four encounters, it was a bewildering experience for her legions of fans to witness her abject capitulation and the total absence of fight in her demeanour. Indian badminton supporters have gotten used to seeing her perpetual frown of self-doubt and indifferent body language, but rarely have they seen her appear so disinterested in the outcome of a match as important as a semi-final of a World Tour event. It was as if a changeling had turned up at the Singapore Indoor Stadium, simply to go through the motions of completing a particularly unpleasant task, and signaling the end of the Indian challenge in the $355,000 prize money tournament. No doubt Okuhara has been in outstanding form in this competition, reaching the semi-finals after dropping just one game in her previous three rounds – to Thailand’s Busanan Ongbamrungphan in the second round. 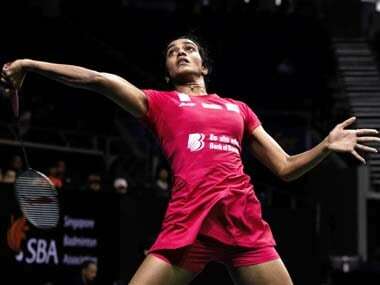 She soundly thrashed Sindhu’s compatriot, Saina Nehwal, by an efficient 21-8, 21-13 scoreline in the quarter-finals. But Sindhu had not played too badly, either, sidelining Chinese teenager Cai Yanyan, who had earlier settled the pretensions of the 2012 Olympic gold medallist, Li Xuerui. However, it is hard to digest what happened on Saturday. Where was the Sindhu who had fought tooth and nail in the 2017 Glasgow World championship final against the same opponent for a titanic 110 minutes, until there was nary a breath left in her lungs? Where was the Sindhu who had played herself to a standstill against Spaniard Carolina Marin in the 2016 Rio Olympics final, and then sportingly crossed the court to greet her tearful and prostrate rival with a warm smile of congratulations? From the very outset of the duel, when the 23-year-old Hyderabadi conceded 5-0 and 9-1 leads to the sprightly, determined Okuhara, the Indian seemed resigned to seeing her tepid challenge blown away. While the pocket-sized Japanese initially prepared to settle into her attritional groove and play lengthy rallies, she soon found that her antagonist was a full pace slower than usual and prone to making errors of all hues, particularly in the exchanges at the net. After taking clumps of points at regular intervals and pocketing the opening game without even breaking a sweat, Okuhara found Sindhu springing to life all too briefly at the start of the second stanza. Perhaps a pep talk by coach Pullela Gopichand during the short gap between the games roused his ward into action. Alas, it was all too brief, and lasted only until 4-all, after which Okuhara stepped on the gas pedal and moved smoothly to 11-5. There is little to write about in the second half of the game, as the one-way traffic continued until 16-5, virtually sealing the outcome of the encounter. There was a brief spark from Sindhu to move from 8-19 to 11-19, but three points at that stage were too few, too late. In Sunday’s final, Okuhara will take on Taiwanese top seed and World no 1, Tai Tzu Ying, who worked a Houdini act by saving five match-points in the second game of her epic clash against Japan’s third-seeded Akane Yamaguchi, before winning at 15-21, 24-22, 21-19 in three minutes shy of the hour mark. This semi-final produced badminton of the highest quality, and was in stark contrast to the eminently forgettable Okuhara-Sindhu match that was to follow. The stocky Yamaguchi played brilliantly to outpace Tai for the greater part of the first two games, and seemed certain of scoring her eighth victory in 17 meetings with the Chinese Taipei star, when she stood at 20-16, match-point, in the second game after winning the opening stanza with a degree of comfort. But Tai had other ideas, and remained calm and collected as she upped the pace and used her amazing wrists to send Yamaguchi scurrying from one corner of the court to the other, maintaining iron control over the length of her shots, to neutralise the potentially match-winning lead. She saved another match-point at 20-21 before winning four of the next five points, to thrust herself back into the match. Tai was once again in trouble when she fell 6-12 behind in the decider, falling into repeated error after producing some brilliant shots. But she refused to bite the bullet, and kept pushing Yamaguchi more and more into a corner until she finally caught up at 17-all, and went ahead to 20-17 with a six-point burst. The Taiwanese then held off a desperate last-gasp push from the diminutive Japanese to seal her final berth. The capacity crowd at the Singapore Indoor Stadium were fortunate to have a fabulous evening’s entertainment, as the two men’s singles semi-finals also produced badminton of a very high calibre. In the longest and most exciting duel of the day, seventh-seeded Indonesian, Anthony Sinisuka Ginting, came up trumps against the defending champion and No 2 seed from Chinese Taipei, Chou Tien Chen, by a 21-17, 18-21, 21-14 verdict. The pint-sized 22-year-old Indonesian, who missed winning the 2018 Asian Games gold medal after being pulled back from match-point by his fellow-countryman, Jonatan Christie, played fast and furious, raining down a barrage of smashes on Chou, who defended stoutly for the most part. Their jousting made for some high-quality rallies, and the tide ebbed and flowed, first in one direction, then the other. A nasty fall while diving for a shuttle at 16-12 in the decider caused Ginting to injure the back of his playing hand; he required medical attention to stem the bleeding from the peeled-off skin. But he did not let it divert him from his objective of slipping it across Chou for the fifth time in nine career meetings. Ginting, who had beaten the No 4 seed from China, Chen Long, in the quarter-finals, will take on the Japanese top seed and reigning world champion, Kento Momota, who scored his twelfth victory in 14 meetings with the 2017 world champion, Viktor Axelsen of Denmark. Momota won at 21-15, 21-18 in 46 minutes, actually making up a huge 6-16 deficit in the second game over a player whose mind he appears to have gained complete control over. Momota leads 6-3 in his new-found rivalry with Ginting, and is strongly favoured to win the title on the morrow. The two have met seven times in tournaments since the Malaysia Open in June 2018, and Momota has won five of those encounters, including the most recent one at 21-9, 21-10 in the Indonesia Masters in front of Ginting’s home crowds in January this year. Sunday’s finals begin at 10,30 am IST.